Have you ever wondered what a nebula may look like in 3D? Wonder no more! Due to the vast distances that separates objects in interstellar space, it’s very unlikely that any of us will ever get to see these things up close and personal with our own two eyes. Though that doesn’t stop incredibly artistic people from breaking the mold and presenting us with something that is truly spectacular. This is one of those things. Located a little over 2,000 light-years from Earth in the constellation of Cepheus, a stellar nursery was born from a huge interstellar cloud of gas. The nebula, IC 1369 (also commonly referred to as the Elephant’s Trunk Nebula) — is monstrous in size. It extends hundreds of light-years across and even as far away as it is from Earth, it takes up an area that is wider than six FULL moons in our sky (a full three degrees! 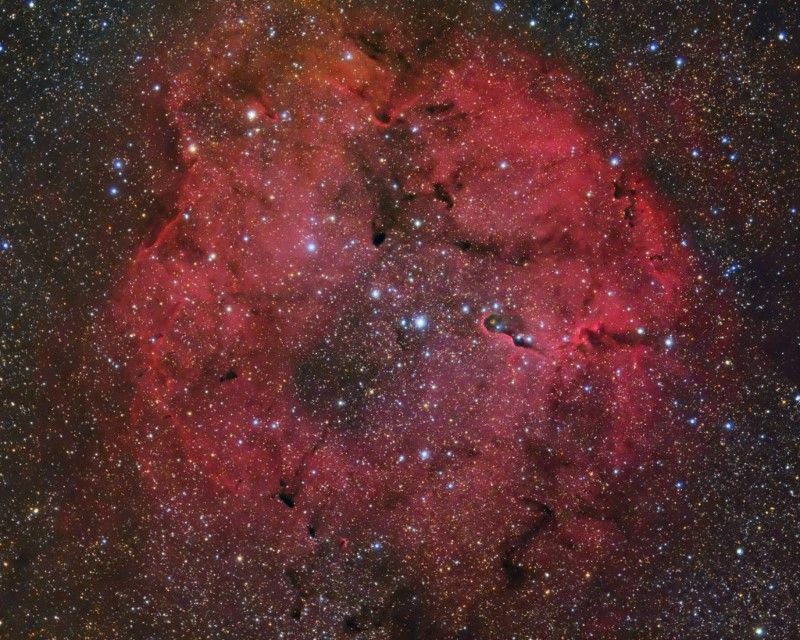 ), making it one of the largest emission nebulae discovered thus far. In the top right portion of this region, we see a red-supergiant by the name of Mu Cephei. The star itself is also one of the largest stars to have ever been discovered. It comes in with a diameter that is larger than the orbit of Saturn, or about 2,356 times the diameter of the Sun (it’s also about 300,000 times more luminous!). One more interesting bit and I’ll leave you to marinate in its awesomeness; The nebula would appear as red on the outside with the interior appearing blue. As the proto-stars transitioned to main-sequence stars to live out their lives, their combined stellar winds have steadily blown large portions of the gas from the cavity, leaving behind a shell. The gas that remains in the shell remains in close proximity to the central stars, allowing the oxygen in the gas to glow blue, but as the gas drifts from the stars, the starlight weakens too much to make the oxygen ions glow in the same way they would closer in, thus the only thing that is visible is the ruddy glow from the hydrogen.